A GSE that is formally part of the FCS but independent from it is the Federal Agricultural Mortgage Corporation (Farmer Mac). Farmer Mac issues its own securities and use the proceeds to purchase mortgages from financial institutions that help fulfill the mission of the FCS. Farmer Mac also provides guarantees against the mortgage-backed securities issued by its special purpose entities, and provides advances that are secured by agricultural real estate and loans guaranteed by the US Department of Agriculture, among others. Fannie Mae (Federal National Mortgage Association) was a government agency created in 1938 to improve the liquidity of mortgages by purchasing mortgages insured by the Federal Housing Administration (FHA) and the Department of Veteran Affairs (VA). Until the 1966 financial crisis, Fannie Mae remained a minor player in the secondary market for mortgages, but the crisis led Fannie Mae to enlarge its purchases to conventional mortgages and it became the largest participant in the secondary mortgage market. Heavy government involvement in private affairs (here conventional mortgages) is never seen with a good eye in the United States, and this involvement required larger spending than the U.S. Congress was unwilling to provide on a continuous basis. Therefore, in 1968, the U.S. Congress split Fannie Mae into Ginnie Mae (Government National Mortgage Association)—a government agency taking the role of Fannie Mae—and Fannie Mae that became a private corporation that deals in conventional mortgages and related securities, that conform to specific criteria set by Fannie Mae. Freddie Mac (Federal Home Loan Mortgage Corporation) was created by act of U.S. Congress in 1970 to compete with Fannie Mae in the conventional mortgage market. The FHLBS also competes with Fannie Mae and Freddie Mac to purchase mortgages. Both Fannie Mae and Freddie Mac have created special purpose entities that pool mortgages and issue mortgage-backed securities insured by Fannie and Freddie. While most GSEs currently deal with residential and non-residential mortgages, from 1972 to 2004, Sallie Mae (Student Loan Marketing Association) used to promote college education. The goal was to encourage financial institutions to grant credit to students at affordable terms although students usually have no or poor creditworthiness. In exchange of the payment of a premium, Sallie Mae guaranteed the timely payment of the student debts to financial institutions. In 2004, Sallie Mae was privatized and began to provide credit to students. Like GSEs, the U.S. government is also involved in providing credit to, and protecting private financial institutions against the default of, specific economic sectors for economic activities that are deemed socially beneficial. Government financial programs cover housing, education, small businesses, agriculture and others. These programs help provide credit at preferential conditions (lower interest rate and/or longer term to maturity and/or lower downpayment and/or lower credit score threshold, among others) to specific economic units. Such economic units include low-to-moderate income households, veterans, students, small businesses, small farms, households with low credit score, among others. Private financial institutions would normally, either refuse to grant credit to them, or do so only at high cost because of higher credit risk. Given that these financial programs aim at delinking partly or fully credit risk from the terms of the financial instruments, the financial instruments issued under these programs are unconventional and do tend to record a higher delinquency rate. Government indirectly provides credit through institutions such as the Federal Housing Administration (created in 1934), the Veteran Affairs (created in 1930), the Small Business Administration (created in 1953), and Ginnie Mae (Government National Mortgage Association). These Administrations provide protection to the bearers of unconventional financial instruments by insuring or guaranteeing their servicing. For example, FHA mortgages are mortgages issued by households and held private financial institutions that are insured by FHA. Households must pay a mortgage insurance premium every month and FHA ensures the timely servicing of mortgages if households default. The VA also ensures timely servicing but merely by providing its partial backing, that is, it ensures timely payment on a portion of the debt service due without asking households to pay an insurance premium. SBA does something similar for the financial instruments issued by small businesses. Ginnie Mae guarantees the timely payment on mortgage-backed securities (MBSs) backed mostly by mortgages insured by FHA and guaranteed by the VA. This allows commercial banks to sell these MBSs at a better price and so to remove FHA and VA mortgages from their balance sheet at a lower cost (see Post on securitization). FHA mortgages have an average default rate of over 10 percent—well above the average of all mortgages (Figure 19.38)—and so carry a higher interest rate. However, the default rate on these mortgages is also very stable. This can be contrasted with subprime mortgages that have a volatile default rate and were defaulting at a much higher rate in 2009 and 2010, when one quarter of subprime mortgages were in default. Even the default rate on prime mortgages tripled during that time from 2.5 percent to 7.5 percent. Post 14 explains that this had a lot to do with changes in underwriting requirements in the private financial sector. Beyond backing private financial instruments through insurance or guarantee, government also directly provides credit. For example, students reading this book probably heard of the Perkins loan program, the SBA also directly provide disaster assistance loans to small businesses for repairs, and the Farm Service Agency provides direct credit to farmers temporary unable to obtain credit through private institutions. Table 19.4 shows the balance sheet of Ginnie Mae in 2007. The two main assets among the $13 billion outstanding are funds with the Treasury and Treasuries. Like many other federal government agencies, Ginnie Mae has accounts at the Treasury and all receipts and expenses of Ginnie Mae are processed by the U.S. Treasury. Its main liability amounts to $536 million related to loss reserves for its mortgage-backed securities, that is, Ginnie Mae records a liability for the expected payments it will have to make to ensure the timely payment of MBSs it guarantees. Loss reserves go down with actual losses and go up with recovered funds (mostly obtained for servicing fees it charges on the payments it makes to MBS bearers). Ginnie Mae does not have capital, instead the U.S. Government covers any discrepancy between assets and liabilities by committing to make payments due by Ginnie Mae. In 2007, this discrepancy was worth $12.6 billion and it represents mostly commitments made by Ginnie Mae to insure mortgage-backed securities. Finally, one may look at the overall balance sheet of the U.S. Government to get a broad picture of its involvement in the financial system (Table 19.5). The U.S. Treasury funds most of the operations of the U.S. government, and maintains a record of incomes and outlays for all the Departments and Agencies. There were $465 billion of monetary assets held by the U.S. government. The U.S. government counts as monetary instruments unminted gold and silver that back gold certificates and silver certificates (the certificates are included in other liabilities). There was $11 billion worth of gold (valued at the official price of $42.2222 per fine troy ounces) to back the $11 billion worth of gold certificates still outstanding. The two other main assets of the U.S. government are physical assets (building, land, furniture’s, among others) valued at $980 billion and loans. Most loans are made by the Department of Education with a net outstanding amount of over $1 trillion, followed by loans from the Department of Agriculture with net outstanding loans of $69 billion. The main liability is Treasuries held by the public, that is, Treasuries held by economic units other than federal agencies such as the Social Security Administration. The outstanding value of Treasuries held by the public was $14.1 trillion. The second main liability, worth $7.2 trillion, is benefits to be paid to veterans and federal employees (pensions, healthcare coverage, and burial services, among others). One may note that the value of liabilities is far superior to the value of assets with a net worth valued at -$19 trillion. The U.S. government is massively insolvent in terms of balance sheet (and cash flow given that it usually records a deficit) if one thinks of the U.S. government in the same way as a private business. Of course, that is not the case, the U.S. government can make all payments due on its liabilities in a timely fashion because its fiscal agent, the Federal Reserve System, is monetarily sovereign. The Federal Reserve System shares that sovereignty with the U.S. government through a comprehensive coordination with the U.S. Treasury to accommodate the financial needs of the U.S. government (see Post 6). One can get an idea of how the balance sheet of the U.S. Government has changed overtime by studying the data of the Financial Accounts. The Accounts do not provide the same number because they do not include all of the aspects of the balance sheet of Table 19.5. Notwithstanding, the accounts show a massive negative net worth with assets of $5.4 trillion and liabilities of $18 trillion (Figures 19.39 and 19.40). Financial assets represent about 30 percent of total assets through time, and within them, non-marketable financial instruments (mortgages, student debts, and others) are the main financial assets. 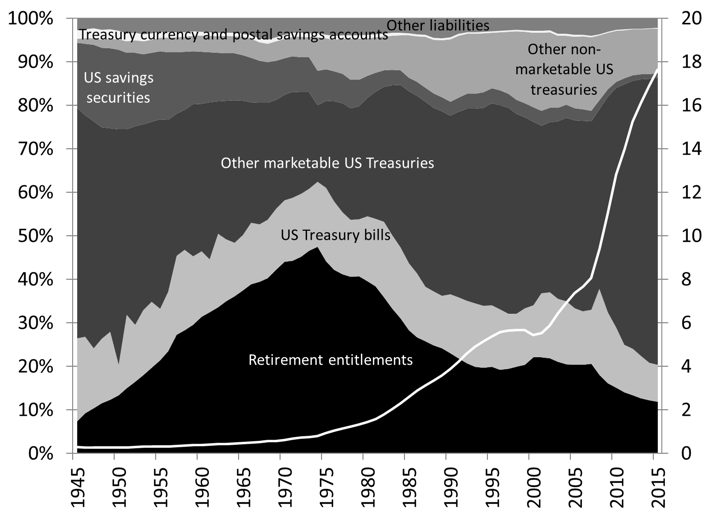 Financial liabilities are mostly composed of Treasuries and retirement entitlement liabilities (claims of federal pension funds on the U.S. government and retiree health care funds) although the relative importance of Treasuries has grown since the mid-1970s. Note: Land is not included in nonfinancial assets. Note: “Other financial assets” includes equity in GSEs, trade receivables, nonofficial foreign currencies, equity in the funding corporation set up for the Public–Private Investment Program created during the Great Recession, among others. Note: “Other liabilities” includes budget agency securities, trade payables, multifamily residential mortgages, special drawing rights, among others. In this Post and Post 18, a lot has been said and shown about the balance sheet and the functions of different sectors of the financial system, but a vital part of the system was left aside: accounting firms. Accounting is tedious, unglamorous and relegated to the “back office,” but without it there cannot be a financial sector. Accounting is about providing a record of transactions and outstanding balances to give managers and outside analysts an idea of the financial state of an economic unit. Money is the blood of finance, trust is its heart, and accounting is its backbone. Without accounting, one cannot draw a balance sheet statement, income statement, or cash flow statement; finance becomes a black box and one can trust but not verify. One should always verify, especially when money is at stake. Accounting can be arcane and can be manipulated to one’s favors, and it is also the most effective tool to create a fraudulent financial scheme. Fraud is about creating trust and subverting that trust for personal gain; it is about deceiving others for personal gains. A fraudulent scheme cannot continue for long unless one can subordinate accounting to the need of the scheme. And indeed case of financial frauds have been numerous, even since the beginning of the 21st century: Mortgage fraud, LIBOR fraud, securities fraud, Fannie Mae accounting fraud, among others. How should the value of assets be measured? Shall one use their current market value, that is, the value at which they can be sold now? Shall one use the value at which they were purchased minus depreciation and if so how does one measure depreciation? Shall another method be used? How should the value of income and cash flow be measured? Shall we use an accrual basis or shall we use a cash basis? Shall interest incomes due be recorded as incomes even if they have not been paid (accrual accounting) or shall one wait for the actual payment to be made (cash accounting)? How should capital be measured? Can some bonds be included in capital? Are common stocks the only financial instrument that can be counted as capital? What is a proper amount of capital? Major financial stakes are at play depending on how these questions are answered. For example, Countrywide reported $295 million in deferred interest revenues for the twelve months ending June 2006, vs. $5.9 million in the previous twelve months. For other mortgage bearers, deferred interest represented up to 67 percent of their pre-tax profit. Accrual accounting has its uses—in fact most businesses and all governments are required to use accrual accounting—but it can be easily abused. However, in a congressional hearing legislators from both sides, lobbied by the American Bankers Association, demanded the FASB to act and lift the requirement to use level-1 valuation. Therefore, banks could record higher profits and net worth by assuming that securities were worth much more than what market participants were willing to pay for them. Finally, major accounting firms (Ernst & Young, etc.) are subject to competitive pressures and, combined with internal incentives, may give a “clean opinion” (that is put a stamp of approval on financial documents) when there are actually problems. Chief financial officers only last on average for two or three years, and so they have the incentive try to maximize short-term accounting gains so that people in the firm are happy because profitability targets are reached and so bonuses are paid. Some accountants and others inside the firm may come to realize that something is amiss, but they are subject to tremendous pressure not to say anything or are fired if they become whistleblowers. Matthew Lee at Lehman Brothers, Carmen Segarra at the New-York Fed, are example of such remarkable individuals. 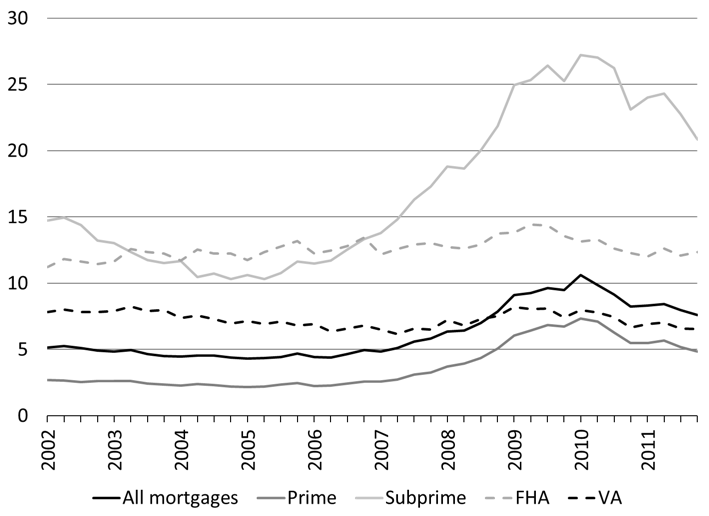 The declining relative importance of private depository institutions. These different trends are briefly presented in this post and some are developed more fully in other Posts. Since the 1970s, there has been an extensive deregulation of the financial sector (see Post 9) that increased competition by removing interest-rate ceilings on savings accounts, by allowing a greater diversification of financial assets that could be held by each financial institution, and by removing branching restrictions. Most of these regulations had emerged after the Great Depression to try to deal with the issues of the time. These regulations progressively became outdated and bypassed as explained in Post 8 and Post 9. Today, the U.S. banking industry is highly concentrated (Figure 19.42) and a few large financial holding companies dominate the industry. 80 percent of the assets of the banking industry are concentrated in the 595 largest banks that account for about 10 percent of FDIC-insured banks. 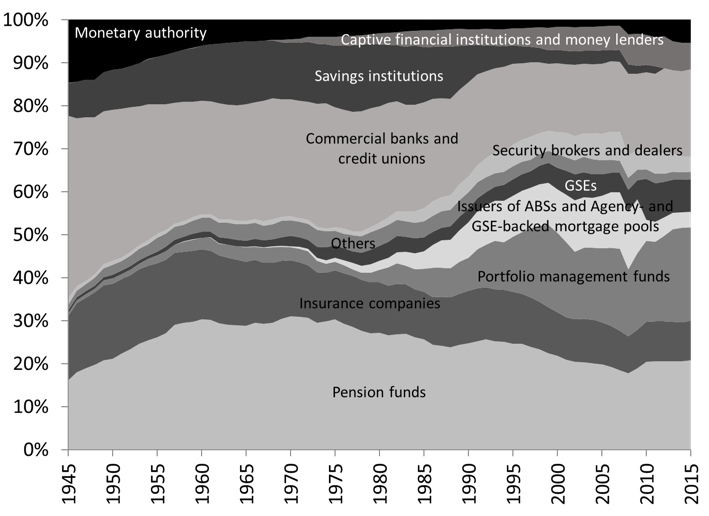 While there has been a concentration of assets among banks, there has also been a concentration off-balance sheet activities. Figure 19.42 and Table 19.6 show the recent data about derivative holding concentration among FDIC-insured institutions; the seven biggest institutions hold 97 percent of derivate contracts held by FDIC-insured institutions, worth almost $170 trillion notionally. Derivatives bring forward the rise of off-balance sheet financial entities and instruments, that will be studied in another Post. From the 1980s, because of monetary policy and regulatory reasons, off-balance sheets operations became a core component of the financial system. The high concentration of the industry means that if one of the banks fails, it may have a major impact on the financial system because it has many creditors. Banks may become “too big to fail,” and so must be saved even though they are not economically viable. This may promote moral hazard—banks take more risks than they would have otherwise because they know the government will rescue them—and so may increase financial instability over time. Beyond concentration, there has also been a diversification of the activities of financial institutions. While the 1930s regulations had compartmentalized the financial system, this was not the case by the 1990s and a financial holding company (all the major “banks” in the United States: Bank of America, Wells Fargo, Goldman Sachs, among others) owns multiple companies that are involved in commercial banking, insurance, investment banking, and money managing. Figure 19.43 shows how the predominance of private depository institutions (commercial banks and thrifts) in the financial sector has changed through time. 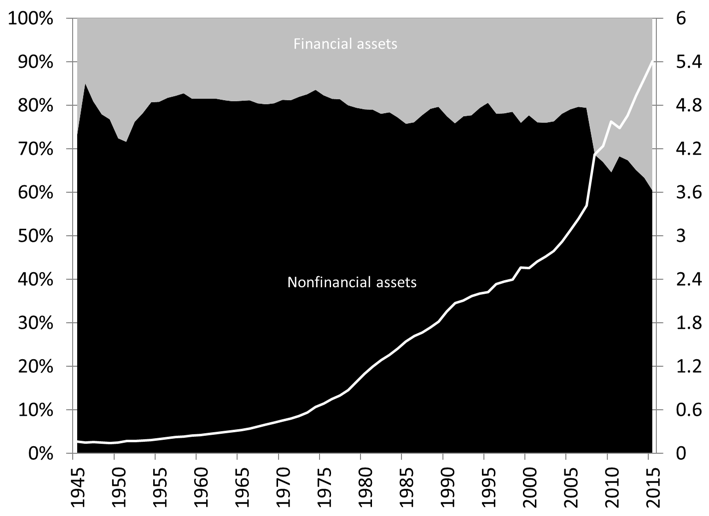 From 1980 until 2000, the share of financial assets held by them fell dramatically from 50 percent of all financial assets held by the financial industry to about 20 percent; this share has been a stable since 2000. Instead, money managers (mutual funds, pension funds, etc.) have gained in importance as did financial institutions related to securitization, which together held about 55 percent of the financial assets held by the financial industry in 2015. 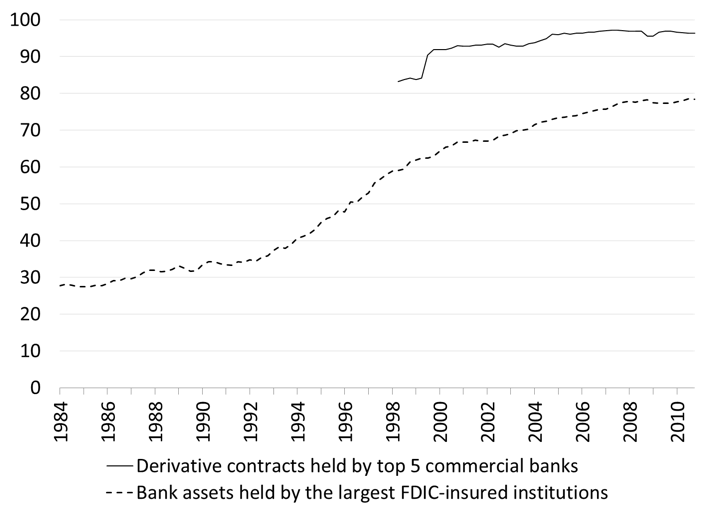 Moneylenders (payday loan companies and others) have also grown in proportion since the mid-1960s. Note: Savings institutions were merged with other private depository institutions in 2011. Finally, a more recent change has been the rapid growth of computer trading and quants. Computers can execute thousands of sales and purchases of financial instrument in a blink of an eye, and they focus on millisecond (or less) changes in the prices of those financial instruments. The rise of computer means a growing need for empirics and mathematics among firms involved in trading, and so the rise of individuals with quantitative skills (quants). When previously one would use intuitions and back of the envelop analysis, together with some qualitative analysis, quants use empirics and mathematics to develop formal trading rules that can be plugged into computers. Nuclear physicists and others mathematical whizzes with no finance backgrounds have been hired to create complex financial instruments and trading algorithms. 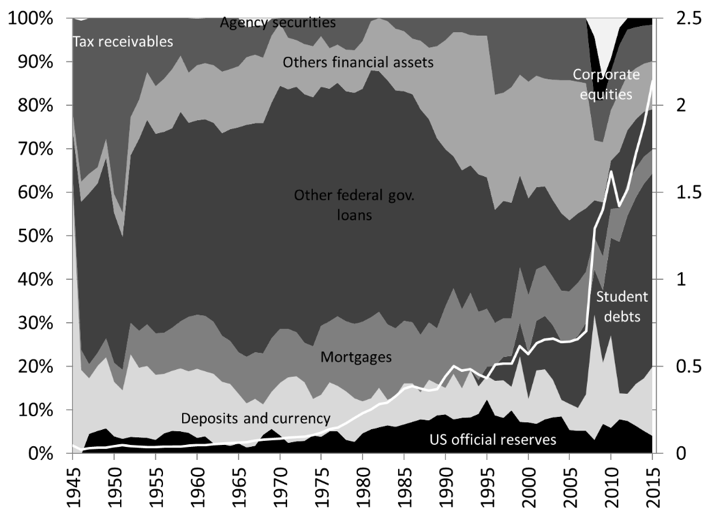 This overall presentation of the US financial system shows that it is complex and vast. Still, this Post left out most the multitude of private and government regulators and supervisors that are part of that system. It also left out credit rating agencies. Financial companies take promises and make promises of all sorts to accommodate the needs of economic units that need funds to pursue economic operations of all sorts: production, consumption, investment, speculation, management of inventories, and protection against all sorts of contingencies that could negatively influence financial well-being. Over the past few decades, the complexity and vastness of the financial system has increased tremendously, with a few giant financial holding companies with revenues as large as the gross domestic product of some countries having a large influence on the system. Another very large influence on the financial system is the U.S. government; either directly through its agencies or indirectly through GSEs. The Federal Reserve System analyzed in Posts 3, 4, 5, and 6 also has a very large influence, in fact an overwhelming influence, in the financial sector in terms of interest rates, reliable payment systems, and the economic impact of financial crises. The financial sector is heavily controlled and subsidized to keep interest rate stables, to reduce interest-rate spreads on specific economic activities, and to ensure that smooth and reliable refinancing channels are available to private financial institutions. Finance is a public-private partnership. Private depository institutions used to be the only institutions to have access to these government channels given their crucial role in the payment system (if they close most payments freeze and economic activity stops because most private economy units use private banks to make payments). The recent financial crisis required extending access to safe refinancing channels to other institutions. This heavy involvement of the government comes with heavy regulation and supervision, but, as explained in Post 9, the will to enforce regulation may not be there.